“Don’t eat this!” “Eat more of that!” “The keto-what?” “Carbs are the devil!” “Fats are good!” “But not trans fats!” “But what about my cholesterol?” “Am I in ketosis?” “My macros need adjusting!” “Don’t count calories but count carbs? Say what?” “And what the hell is a carb anyway?” “IT’S ALL SO CONFUSING! I GIVE UP!” Are you at that point yet? You’ve tried so many things, yet you’re still fat. Have you resigned yourself to being fat forever? Are you trying to convince yourself that you’re happy? Are you finding work-arounds to exist in this world as a fat person? If this resonates with you then you’re the person I’m talking to. Don’t give up just yet… This is the Information Age, and so today, our challenge is not accessing information. Our challenge is to be able to sift through the plethora of information out there, triangulate and then decide what is valid from what is sheer quackery. So I get it. The frustration at being able to nail down exactly what to do to lose weight is all too real in the face of all the information out there. One person says “eat more fat to lose weight!” And another person insists that juice cleansing is the way to go. And yet another person says eat a wholly plant based diet. So who is right? 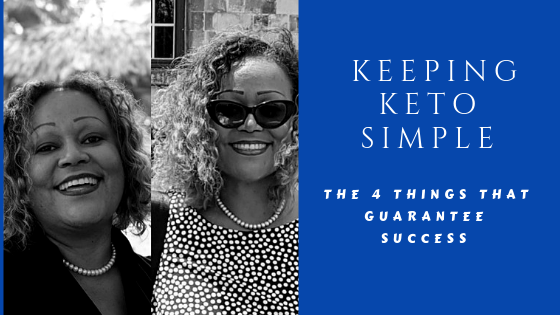 Continue reading Keeping Keto Simple: The 4 things that guarantee success. Posted on April 7, 2019 April 9, 2019 Categories Health and WellnessTags Atkins, food choices, healthy fats, insulin resistant, keto, keto diet, keto made simple, labels, Low carb, real food, simplifying keto, success, water, weight lossLeave a comment on Keeping Keto Simple: The 4 things that guarantee success.